PROVO, Utah (Mar. 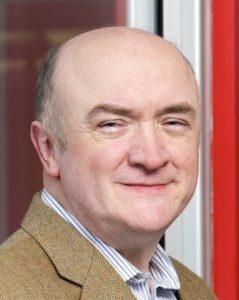 20, 2018)—McEnery is the current director of the Economic and Social Research Council (ESRC) Centre for Corpus Approaches to Social Science at Lancaster University. His program allows sociologists, historians, economists, engineers, and so many others, to come and learn corpus linguistics methods so they may interpret data from their own fields. The ESRC is an interdisciplinary effort that has helped forge academic bridges—an endeavor McEnery especially enjoys. “Tony is absolutely amazing . . . he’s got over 140 publications, and many of those are books. It’s interesting to see how many of them spread out into different fields,” commented Mark Davies of the BYU Linguistics and English Language department. Currently, McEnery works mostly with historians, but also with sociologists and scholars of English literature to analyze seventeenth-century etymology of words associated with poverty. Taking a deeper look at how marginalized, impoverished groups were discussed at the time, McEnery notes that the words have different meanings today and that, for research purposes, true definitions live only in their past time and context. McEnery disclosed, “Sometimes when I work with data sets, it feels like time travel. You’re traveling back to see these impressions of attitudes, views, individuals, groups, and I find that quite exciting. . . . You come across these mindsets from the past [and] . . . sometimes they shock you because of the things that they’re saying.” He describes his experience with the recovered texts to be like hearing singing from the past that reveals how the impoverished were truly seen back then. In his research, McEnery placed words like “rogue,” “beggar,” and “poverty” under a microscope to uncover their shifting meanings throughout time. For example, McEnery found that the word “rogue” in the seventeenth century had associations to words like “gipsy”, “Irish”, and “beggar”. In contrast, modern language now views “rogue” in conjunction to words like “pretty” and “witty”. He mentions, “Words [like] rogue, beggar, vagabond, are similar, but not synonyms—true synonyms are actually rare . . . What the word[s] denote back then and what the word[s] mean now are very different things.” Ultimately, McEnery believes that by triangulating together historical, literary, and linguistic evidence, researchers can record a more holistic view of attitudes toward marginalized groups over the centuries. His interdisciplinary approach to linguistics has brought uncommon collocations into view. McEnery’s legacy is reaching across disciplines to facilitate more comprehensive and inclusive linguistics research. He says, “The study of language is not reserved for linguists; we may be particularly focused upon it, and we may think we know the methods in detail and interesting ways of looking at it, but other disciplines talk about language too . . . and offer insights that linguists can explore and challenge sometimes.” Together, McEnery and other professionals are changing the power of language to be an academic goldmine for people of all disciplines and studies.